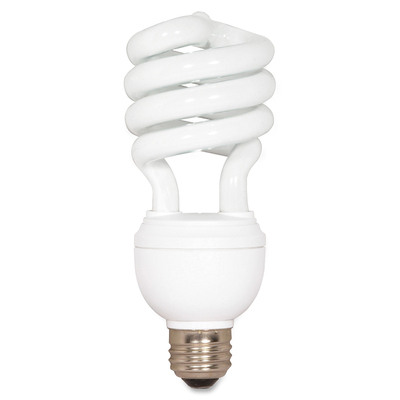 This Three-Way, T4-Size Bulb Uses 12/20/26 Watts Of Energy, Which Is Equivalent To A 30/70/100-Watt Incandescent Light Bulb. Floodlight Has A Cri Of 82 And Is Capable Of Producing 660/1200/1600 Lumens For 10,000 Hours. At 2,700 Kelvin, This 120-Volt Floodlight Is Great For Lighting Areas Where Harsh, White Light Is Not Desired. Fluorescent Floodlight Is Nondimmable And Features A Medium Base. Energy Star Qualified And Rohs Compliant.. This Three-Way, T4-Size Bulb Uses 12/20/26 Watts Of Energy, Which Is Equivalent To A 30/70/100-Watt Incandescent Light Bulb. Floodlight Has A Cri Of 82 And Is Capable Of Producing 660/1200/1600 Lumens For 10,000 Hours. At 2,700 Kelvin, This 120-Volt Floodlight Is Great For Lighting Areas Where Harsh, White Light Is Not Desired. Fluorescent Floodlight Is Nondimmable And Features A Medium Base. Energy Star Qualified And Rohs Compliant.